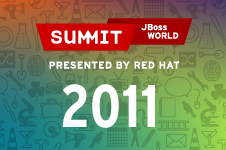 For more than a decade, Red Hat has set up open source shop and hosted Red Hat Summit and JBoss World in various locations in the United States, and internationally. More than 7,800 people discussed how open hybrid clouds are supporting emerging technologies―and other ideas worth exploring―at the 14th annual Red Hat Summit in San Francisco, CA. The event kicked off with an A/V intro by DJ Cut Chemist. We announced expanded alliances with Microsoft and IBM for hybrid cloud environments before demoing new Red Hat OpenShift capabilities including vm migration, a CoreOS integration, Kubernetes Operators, and container-native virtualization. UPS was named Innovator of the Year for delivering real-time data insights—and a better customer experience―while coding kids Ellie Galloway and Femi Owolade-Coombes shared what they think makes open source the key to innovation. Dana Lewis and Zui Dighe were recognized with Women in Open Source Awards for using open source to revolutionize healthcare. Neha Sandu was named Red Hat Certified Professional of the Year. We hosted the world premiere of our film The Science of Collective Discovery and we wrapped up the week with a party featuring the Grammy Award-winning band Weezer. 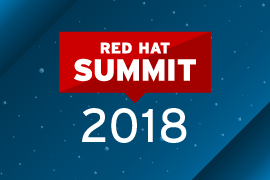 Check out highlights from the 2018 Red Hat Summit. 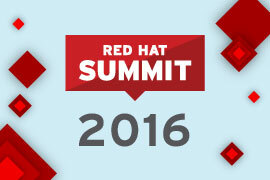 The 13th annual Red Hat Summit took place in Boston, MA, and was hosted at the Boston Convention and Exhibition Center for the first time. Headlined by our OpenShift.io announcement—a free, online development environment optimized for creating cloud-native, container-based applications—we focused on the importance cloud-native applications in a hybrid world. Orhan Bıyıklıoğlu was named Red Hat Certified Professional of the Year for his role in a large server consolidation project. Avni Khatri and Jigyasa Grover were recognized as Women in Open Source Award winners for empowering children to change their lives through technology and encouraging more women to become IT professionals. And RackSpace was named innovator of the year. Oh, and we may have celebrated May the Fourth with a lightsaber duel and some cameos from a galaxy far, far away. 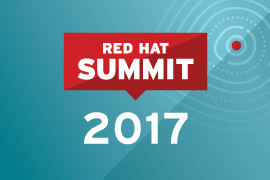 The 12th annual Red Hat Summit was hosted in San Francisco, CA, where we announced our commitment to container technologies. Headlined by new container environments, enhanced storage integration, and Red Hat Insights (a Software-as-a-Service analytics platform), we developed a stack for enterprises to quickly adopt the DevOps practices Burr Sutter highlighted in his mind-blowing general session. Jessica McKellar and Preeti Murthy were recognized with Women in Open Source awards for making open source communities more inclusive and supporting the Linux kernel, respectively, while Amadeus was named Innovator of the Year for using containers to simplify travel. Oh, and two amazing people got married on stage. Yep, in true open source fashion, Shannon Montague and Matt Hargrave shared their wedding with the whole world. The 11th annual Summit was hosted back at the Hynes Convention center in June 2015. At this year's event, the discussion was centered on key technology themes like mobile, big data, DevOps, and more. We hosted our largest group of customers, partners, and open source enthusiasts to date, and tapped into the current of innovation flowing through the open source ecosystem. We shared big news like our technology partnership with Samsung, the release of OpenShift Enterprise 3, and the launch of Access Insights to keep our customers protected from security vulnerabilities. 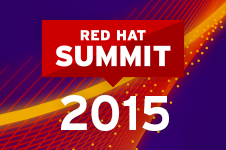 Check out highlights from the 2015 Red Hat Summit. The 10th annual Red Hat Summit moved across the U.S. for the first time in years, and hosted more than 4,500 customers, partners, and contributors in the Moscone Center in San Francisco, CA. Among other exciting announcements, Red Hat shared the latest innovations in container technology with the launch of Red Hat Enterprise Linux Atomic Host and the start of Project Atomic, the upstream community for container technology development. Through keynotes, breakout sessions, labs, parties, and more, the Red Hat Summit community came together again, and joined forces to advance technology. 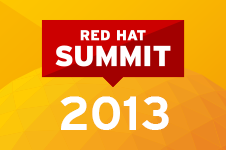 The 9th annual Red Hat Summit was held at the Hynes Convention Center in Boston again in June 2013. At the event, Red Hat was able to connect more customers, partners, and contributors than ever before. The primary themes focused on open hybrid cloud and customer success while our product announcements highlighted OpenShift Online, Red Hat JBoss EAP 6.1, Red Hat Enterprise Virtualization 3.2, Red Hat Enterprise Linux OpenStack Platform, and Red Hat Cloud Infrastructure. 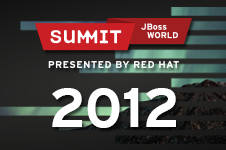 The 2012 Red Hat Summit was held in the heart of Boston on Boylston Street at the Hynes Convention Center. The event brought together a record number of customers, partners, and contributors to bring Red Hat's ecosystem of innovation to life. Jim Whitehurst shared Red Hat's vision as the first billion dollar open source company, while Paul Cormier and Brian Stevens gave updates on Red Hat's expanding portfolio of enterprise solutions. Returning to the Seaport World Trade Center in Boston, the seventh annual Red Hat Summit and JBoss World was a forum for sharing knowledge and best practices for platform, middleware, management, and virtualization solutions as well as the future of the open cloud. With a focus on interoperability and portability with our partners, a theme of "Mix Well" was felt throughout the 136 breakout sessions, keynotes, and campgrounds. We also demonstrated this commitment with our best "mixes" of open source solutions for maximum effect for our featured customers on our customer walkway. Red Hat also shared our cloud strategy with the community and announced two new cloud offerings: OpenShift and CloudForms. Red Hat took the party back to Boston in 2010, hosting both events at the Seaport Hotel and World Trade Center, June 22–25, 2010. Highlights included visionary keynotes and product announcements from Jim Whitehurst, Paul Cormier, and Brian Stevens touting the importance of cloud computing and virtualization to meet the new demands placed on IT. The event off-site party was hosted at Quincy Market and Faneuil Hall, followed by the ever-popular Red Hat Summit and JBoss World pub crawl. The Hilton Chicago was home to the fifth year of the Red Hat Summit and JBoss World, held September 1–4, 2009. It was the first time the two events were co-located. From the head of digital operations at DreamWorks, to the CIO of GEICO, and CTO of the New York Stock Exchange—the keynote topics covered it all. Red Hat also announced the availability of JBoss Enterprise Application Platform 5, Red Hat Enterprise Linux 5.4, and a new open source cloud community project—Deltacloud. 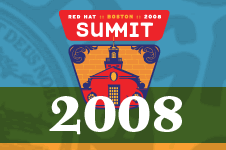 Summer was in full force when Red Hat landed in Boston in June 2008 for the fourth-annual Red Hat Summit. Notable keynoters included: the CIO of Harvard Medical School, the co-executive producer and writer for The Simpsons, and the general manager of IBM. Red Hat announced the availability of Red Hat MRG, which delivers realtime capability and high-performance messaging. Also announced was Red Hat's initiative to advance open virtualization through an embedded Linux hypervisor, virtual infrastructure management, and security infrastructure. Red Hat spent Valentine's Day in sunny Orlando for the 2008 JBoss World, where the event focused on enterprise-ready middleware advancements. 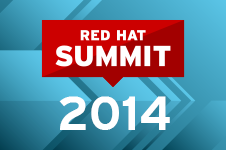 Red Hat announced several community projects, as well as the release of JBoss Enterprise SOA Platform. 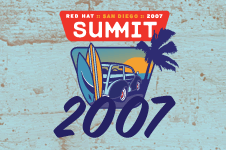 Red Hat took open source innovation to the west coast for the third-annual Red Hat Summit in May of 2007. During the event, Red Hat and IBM announced a worldwide Enterprise Linsummit-On-Mainframe Program, and Alan Dechert of the Open Voting Consortium keynoted on the importance of open voting systems in the future of US and worldwide elections. JBoss World traveled internationally to Germany for the third year of the premier open source middleware events. 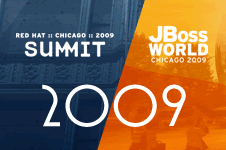 From middleware and management advancements in open source, to SOA and security technologies—the 2007 JBoss World covered it all. 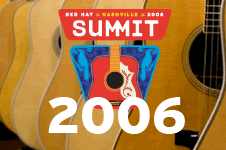 Shadowman donned cowboy boots and a hat when Red Hat went south for the 2006 Summit in Nashville. During the event, Red Hat announced its increased collaboration with the One Laptop Per Child initiative, as well as the launching of Mugshot and new testing tools and processes. Top keynotes included Cory Doctorow from the Electronic Frontier Foundation and Eben Moglen, founder of the Software Freedom Law Center. 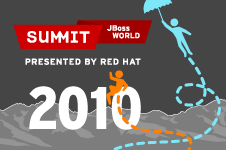 The second-annual JBoss World took place in Las Vegas, and was the first time the event took place as part of the Red Hat family. During the event, JBoss unveiled it's open source enterprise management strategy, extended certification to software-as-a-service applications, and JBoss Seam 1.0. 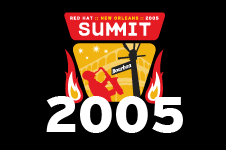 Red Hat's first-annual Red Hat Summit kicked off with a bang in the city of New Orleans. Stellar keynoters from igrep, IBM, HP, and Magnatune spoke about the future open source would play in the enterprise. During the event, Red Hat called for intellectual property and patent policy reform and announced the availability of Red Hat Directory Server. 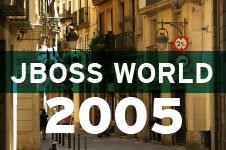 The inaugural JBoss World was held in Barcelona and was the first step for JBoss in becoming the premier open source middleware event and set the standard for the stellar open source experience attendees will experience at the 2010 Red Hat Summit and JBoss World.